If you were celebrating, I hope you all had a very happy Easter! 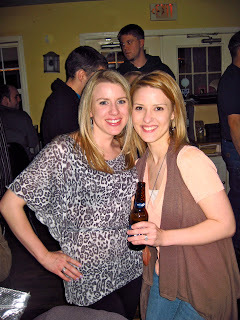 We went back to Indiana on Saturday night, and met up with our very good friends, Dusten & Shelby. We always have a blast hanging out with them and don't see them nearly enough! We went to a bar in the area to enjoy some cocktails and lots of laughs. One thing led to another and it turned into a pretty late night. We headed home, I munched on some Cheetos (I know, gross, but marginally better than pizza, right?!) and went right to bed. Sunday we woke up and went over to Justin's Aunt Jackie's for a delicious Easter brunch. There was tons of food, from ham to baked mastaccioli with meatballs, to some amazing baked goods made by Justin's Grandma. I would have taken pictures of my plate, but I was a little bashful about whipping out the camera at our table. After brunch we all hung around for a while to talk and snap some pictures outside. My eyes were super squinty in every picture because, even though it doesn't look like it here, it was eye-piercingly bright out. The "kids" (anyone under the age of 13, I'd say) went on an Easter egg hunt and had a ball. Justin's little cousin Will found $2 and he was thrilled -- he told me "now I can even buy my own toys-es!" He named off a list of about 10 things he was going to buy, including "Batman, Superman, Spiderman..." Seeing a trend?! 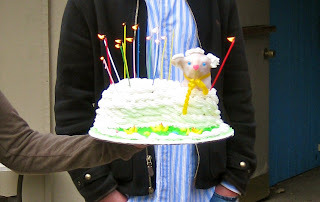 We all sang Happy Birthday to Justin, with a lamb cake, of course! We were all so stuffed, so we went back to Justin's parent's house, changed into our stretchy pants, and took a legendary nap. I said this nap ranked in the top 10 best naps of all times, right up there with the post-Thanksgiving feast nap. I could have stayed there sleeping all night, but we got up in a groggy-haze and headed back to Chi-City. My allergies/lingering cold symptoms were in high gear last night, so I spent most of the night barreling through a box of tissues while we watched the Hawks pull out a big V! So today, I have a recipe for your daily dose of happiness, and, guess what?! It does not involve Cheetos!